Wow — this is completely new to me, and I’m looking forward to trying it. You’re absolutely right about discovering new tastes and new favorite foods when you’re far from home. But the taste memory is powerful, and if properly stimulated, it will definitely bring you back to that food you discovered! thats so beautiful, it looks like mahoganny! wow! i too have fallen under ths spell of this delicious baked treat. i thought i’d just have to pay for the pleasure at the fancy french bakery. and seeing as just yesterday i bought a four set mini bundt pan i think i might give this ‘pimped up’ version a go. thank you for doing all the research and giving it a go. it reminds me of the time i tried to make a very big gulab jamun cake… it worked… but boy was i sick afterwards. so much sugar! Looks scrumptious. And when you finally crack that salted caramel ice cream, you will let us know, won’t you? You are brilliant! I too have been put off by the cost of cannele molds … but now you’ve made it possible for me to enjoy them. You have my eternal gratitude! you are so brilliantly clever! my bundt pan is so much more valuable now! Love your improv for the molds! This looks delicious! Melissa, I am completely stunned to see such a large display of canele. You had to know that this would send me into a tizzy what with my insane love for them! Next time I’m in Edinburgh, promise me, PROMISE ME! that you will make me one of these. I don’t care if we don’t eat anything else for days, I just want to sit myself down in front of this thing and get to work. Oy. You’re amazing. I saw this post and immediately ordered beeswax from texas. I love canneles, and I was almost ready to drop some serious cash on molds…I will happily give this a try! Pille – Someone just recommended Sushiya to me a few days ago! Thanks for the second opinion – I’ll definitely check it out.Sally – It does make quite a bit, but it keeps forever (I have mine in the cupboard) so once you make up a batch you’ll have enough to fill your cannele-baking needs for some time to come. Don’t sell yourself short on those home made tortillas! Genius! I have been wanting to make tem too but got stopped in my track everytime, precisely because of the molds…duh!…Now I have to decide which recipe to try. What a canelé indeed! You are clever to have found a way to make it without the molds Brilliant! What a genius idea. I have actually had some luck with the much despised by food writers silicon molds. I mean, actually, I thought they were great, but I’ve never had the original…so probably they were not great enough. But this is so cool. Your success makes it evident that someone could make a nice, non-copper, affordable version of the individual molds, from some heavy material…and they would work fine! I hope someone does. I, too, love canneles and have found the most inexpensive place for the copper molds is at the Lemoine cannele shops, located in Bordeaux. On my trip to Paris last week, however, I was happy to discover one of their shops had opened in the 7th near Poujauran. You can get 12 copper molds for about 50 euros. Not bad.Please post the Bertillon recipe when you’ve got it cracked… one of the best scoops of ice cream anywhere! Until you crack the Salted Caramel ice cream…do order yourself a pint of Jeni’s Salty Caramel. http://www.jenisicecreams.com/index.htmlShe ships, and you won’t be disappointed. This could conceivably be better the original for those of us who can’t get enough of canneles! Melissa, you had me at "licking a voluptuously silky crème brûlée from the palm of my hand." Everything that followed was just a blur, really. I love the Calvin Trillin reference — he is perhaps my favourite food writer. Scrap that, actually, and let’s leave it at just "writer." It’s funny you mention Memphis barbecue in the context of the register of frustration and deprivation. My list most certainly includes the ribs from Cozy Corner barbecue in Memphis. No sauce there, however, just dry, but damn if that isn’t the best rib I’ve ever tasted. Crap! I’m pondering my register again…. I first tackled cannele when I came across a silicone cannele mold kit at Sur La Table in the close-out section. I tried Paula Wolfert’s recipe but wasn’t happy with the results as they turned to charcoal following her recipe. 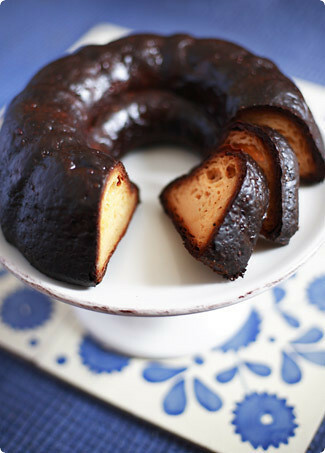 I then began working with other recipes to much better success.There is a very long and good thread on cannele (Paula also contributes to it) in the food forum at http://www.egullet.com.http://forums.egullet.org/index.php?showtopic=44045&hl=canneleSeems to me though, that there is an older, more extensive discussion in egullet too, that you might be able to find. Nice picture! Looks very tasty! Did you use a convection oven? I tried to make this recipe the other day, and it was way underbaked in the middle after 3 hours 😦 I was using a copper, tin lined bundt pan. Any suggestions? Lisa, I was indeed using a convection oven, but mine was done considerably under the 3-hour mark which made me think 3 hours was about right for a normal oven. Based on your experience, though, I’ve revised the baking time above, and I’m going to give it a shot without the fan next time and see how long it takes. In any case, I think the crust is the best indicator – it should be quite dark, glossy, and feel substantial, like thick leather. Hi Melissa, I’ve made a batch of your recipe tonight and will be baking them tomorrow. I am wondering however if the outside is supposed to be *that* dark? I thought at first that you’ve covered your caneles with a layer of chocolate frosting! Did it taste a bit burnt? Also, the batch I’ve put in the fridge is quite watery, is it supposed to be so? Thanks so much, I can’t wait to taste this! Silvia, I’m sure your batter is fine – it’s supposed to be quite thin, like a crepe batter. As for the color, mine did turn out a *little* bit darker than I had intended, but it didn’t taste burnt – the crust was rather like a very intense caramel. Many people prefer their canneles this way, as there’s a nice contrast between crust and filling. You can, of course, remove your cannele a bit earlier if you want a slightly lighter crust, though I wouldn’t go for too light or you’ll be lacking the rigidity it needs to hold its shape. In any case, my fingers are crossed that it turns out, and please do report back with your experiences! So I did it… it turned out pretty good. Visually, it is similar to yours. The insides of mine was very custardly which strangely enough, I don’t prefer. I am amazed that the almost-black outsides did not taste as burnt as I had imagined it to be. You’re right, it tasted intense caramel with just a barely noticeable burnt taste.One interesting thing: during the baking time, there was a considerable amount of oil boiling around the middle of the mold around the flute, I ended up taking it out 2x to drain the oil. Did that happen to you? I had another failure 😦 I baked it for 4 hours total, and ended up with a proper outside, but a large upper air pocket and a mound of somewhat undercooked custard in the bottom 😦 I just don’t know what the problem is.Are you letting the batter come to room temperature before you bake it? Oh, dear lord, I have found my soul mate. I’m making this for my birthday tomorrow. I’ve made this in this manner a couple of times already. Heavens. Silvia – There are other recipes around that produce less-custardy canneles, which you might want to experiment with if you don’t like this one. See my answer to Lisa below for some possible sources. As for the oil, I certainly didn’t have that problem myself. Could the coating of the pan (did you use white oil?) have been too thick maybe? Lisa – that actually doesn’t sound at all wrong to me. Paula Wolfert’s version is indeed very custardy in the center (mine certainly was, though it may not be apparent from the photo), and the air pocket is something that happens occasionally even in normal-sized versions – check out this picture from her book. If you didn’t like it so soft, though, perhaps you might try another recipe that creates a breadier cannele – there are a few recipes interspersed throughout the thread on egullet I’ve linked to above, or you could try the recipe in Nancy Silverton’s ‘Pastries from La Brea Bakery’. EB, you crack me up – Happy Birthday to a newfound soulmate! hee hee it’s a new species of canele; Cannelé Colossuslooks so good!